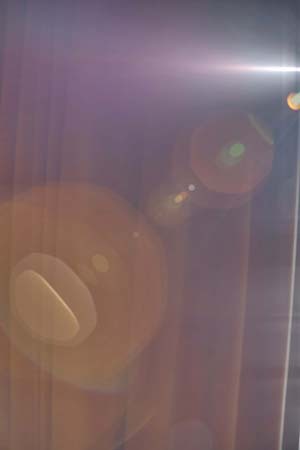 Stray light effects on the photographic image are additive. Therefore, besides the different forms of flare with rather well defined and structured features (they are shown on images row #1 through #5), there is always some sort of uniform haze laying over the image. 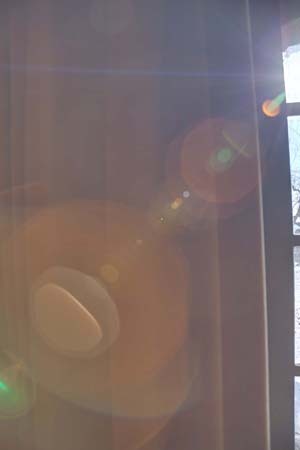 It is caused by addition of scattered light that finally hits the imaging sensor after many different paths within the lens and in the camera mirror chamber. The camera was put vertically (i.e. in portrait mode) with the shutter release button at the bottom: the underside was thus on the left of this image. On all the other same images on this row, Automatic contrast correction by Photoshop was finally applied in order to "remove" most of the veiling and to more clearly distinguish details of other flare effects. This image was produced by Enfusing (w/EnfuseGui) the 13 original bracketted individual images that were converted from raw with all correction parameters set to ZERO. Unlike the others the output was not automatic contrast corrected. The final image is unusually dull and obviously covered with nearly uniform veiling glare. This is normal as the commonly so-called HDR results in such a loss of contrast especially when the individual images are left intact from "S" type of enhanced contrast via correction of linear CMOS sensor output. Flying over the image with the cursor of the mouse will reveal the contrast corrected image.